Dr. Elizabeth Holland is an accomplished board certified cataract and LASIK surgeon, with a special interest in oculoplastic surgery and cosmetic procedures (eyelid surgery, lid lifts, BOTOX). Welcome to Holland Eye Center! Dr. Holland and her staff offer comprehensive eye care services, including routine eye exams, diagnosis and treatment of glaucoma, diabetes, macular degeneration, and cataracts. Ask Dr. Holland how you can be free of your reading glasses with state of the art multifocal implants. 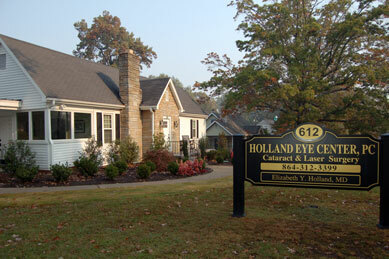 Holland Eye Center is currently accepting new patients. Please call 864-312-3399 to schedule your appointment. We’re looking forward to seeing you!